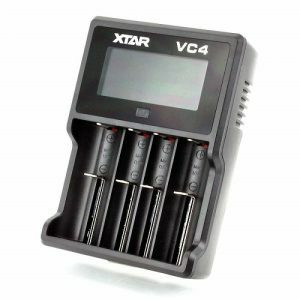 The Efest LUC V6 is a six bay battery charger that supports all battery sizes ranging from 10440 all the way up to 26650. The LUC V6 also sports independent charging rates and charge monitoring on its high-definition OLED display. This charger also sports a USB output feature. However, you need a charged battery to utilize this option. It’s a very high quality charger that can charge up to 6 batteries at a time, at 0.5-2A charging rates*. It tells you the charge levels via LCD screen. 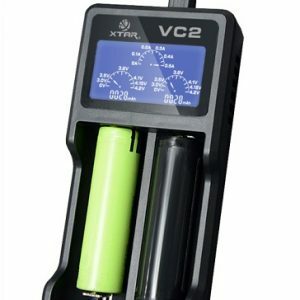 It’s compatible with most 3.7V Lithium Ion or Li-Mn batteries such as 10440, 14500, 14650, 18500, 17670, 18650, 18700, 26500, 26650 etc. It can also charge 15270 or 14250 batteries if you use spacers. *Note you can only charge up to 2 channels at 2A. If using all 6 channels it’s 0.5A.